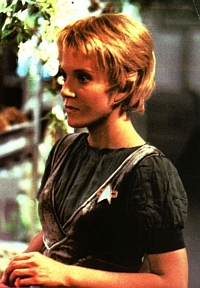 Jennifer Lien as Kes, the inquisitive young revolutionary Ocampa who helps her lover, Neelix, run the officer's mess aboard the STARSHIP VOYAGER in STAR TREK: VOYAGER, the newest installment of the STAR TREK phenomenon. In the two seasons already produced, Kes has become more than just Neelix's consort. She has become invaluable as a medical assistant to the ship's holographic doctor, and thus an important member of the crew. Together they begin to learn and grow in maturity and social skills. In the pilot episode, "Caretaker", when a strange occurrence catapults the U.S.S. Voyager to the Delta Quadrant of the galaxy, the search for kidnapped crewmen takes the away team to Kes' home planet. Kes helps captain Janeway recapture her missing crew, and hitches a ride through the Universe. Commenting on what attracted her to the role, Jennifer says: "Kes is wise and courageous while possessing innocence. Being aboard the starship is a great adventure with the opportunity for development enormous". Born and raised in Illinois, Jennifer knew early on that she wanted to act. Encouraged by an English teacher along with a drama teacher, she began performing in summer theatre and festivals at 13. She began her career on roles in Shakespeare's "The Tempest" and "Othello" before moving on to more contemporary dramatic and musical theatre, and guest starring on an episode of the Oprah Winfrey series "Brewster Place". At 16, Jennifer was hired by "Another World" and moved to New York to portray the newly created character Hannah, a misfit orphan, on the NBC daytime drama. She remained with the show for eighteen months, then gave her face a rest and put her voice to work. She can be heard on "Saturday Night Live" regular Adam Sandler's comedy album, and has guest voiced on "The Critic" and dubbed lines in the English version of the French Miramax film "Baby Blood". Back before the camera, she landed the role of Roanne in the ABC series "Phenom", and appeared in the short independent film trailer "The Hairy Bird". Jennifer enjoys playing the trombone. Kes is a member of the Ocampa race. She is delicate, beautiful, young and has a life span of only nine years. She is the loyal lover of Neelix, but she has an inquisitive streak and is eager to absorb knowledge about the starship and its fascinating crew. She is an innocent who sees humanity through a fresh perspective, and the crew of the U.S.S. VOYAGER never cease to fascinate her. Kes has discovered that she has some unusual mental abilities - abilities of which she was not aware of previously, and which she still can't identify or control. These capabilities have taken the form of vague "sensations" of alien presences and temporal phenomena. Occasionally she is aware that a specific person has been in a room she enters - even when the person has been gone for hours. Kes knows her ancestors did have these powers in the past. 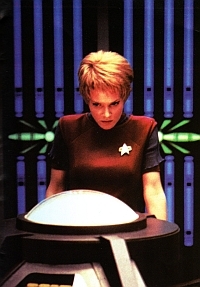 At the original casting of STAR TREK: VOYAGER, when the role of Kes went to Jennifer Lien, the immediate trap to avoid for the writers was to not have her being a pretty sidekick lacking in substance. Dressing the character up as an Ocampa native, with a curious 9 year life span, and teaming her with the aesthetically displeasing, shot squat Neelix as her lover, seemed to give the writers something to think about. Mix this in with a strange elfin-like wig, and Jennifer was now almost unrecognizable. 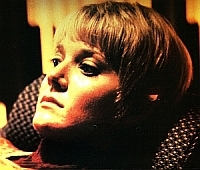 As the show has progressed, the character of Kes has developed very well, and now as the third season commences, further development is in the air. How has season three been progressing so far? Were you expecting the wonderful relationship with the Doctor as his unofficial nurse to happen? Oh no, I didn't expect it to happen - I think it just sort of developed. I guess the writers must have partially planned out the role. There was a need for a nurse and Kes was a 'passenger' to a degree. Her inquisitiveness made her a natural for the role, and the chemistry with the Doctor was right on. As far as the dynamics of the relationship, I didn't think they would be what they are. I am very grateful for this, and it is a lot of fun and a pleasure to work with Bob [Picardo]. Your relationship with both Bob and Tim [Russ] do have very good on-screen chemistry. Yes I have been very fortunate in that Kes has had a few angles played out by the writers. The mentor relationship with Tuvok is very insightful, and through that, the writers can continue to discover and embellish Kes' character. Tim is also very wonderful to work with, and I am glad you say that you feel the chemistry. I don't personally know how the scenes come across to other people, but so far I have been pleased. How does the whole makeup scene affect your acting and characterization? To be honest, it doesn't really affect me at all. By now I am very used to the whole procedure and I'm quite comfortable with it to the degree that I don't even perceive I have makeup on. I bet your hair goes through hell! [Laughing] No not really - it is pinned down so it is not a big deal. At the moment, I have become very unconscious of my hair, and it is relieving to not have to deal with it. You know - not have it styled, and I don't do anything with it either, so it’s kind of nice. I've never thought of it like that, I believe you are a native of Illinois. It is a big move to have first gone to New York City and now Los Angeles with your career. What are your impressions of these two great cities? New York was an extraordinary time for me - I really loved it - especially Manhattan. The people were great and it was a good time in my life. I love going back to Manhattan and catching up with friends - it is just a great city, with a unique type of energy to it. It was an exciting time. I was there long enough to appreciate it, and coming from Illinois, it was a good adjustment - a big change. I like LA too - it is very different. Hollywood itself is difficult to describe. It is so many different things to so many people. A lot of people come out here in pursuit of their dreams. It is a lot of fun here, but personally I look at it very practically - I work here and I enjoy being here because I have a great job and for that I am lucky. It is harder to be out here without a job, as I was for a short time when I moved here, but the whole place is business as well - so many people are tuned in to the entertainment industry and that's cool. I like the fact that when I have time off, I am able to check out Los Angeles as well - and the weather is pleasant here for the most part, all year around. To me the practicality of Los Angeles and Hollywood is clear, but it is fun to play with other people's perceptions of it all. At the moment it is a fun situation for me, but talk to me in about ten years, and we will see how things have changed. It is very difficult to focus in on exactly what the aura and feel of LA and Hollywood is - that, to me is part of the fun of it. It is kind of a crazy, wild place. You are still very young of course, and we just touched upon how you may feel about Hollywood in ten years - what are your actual ambitions in acting once the Star Trek gig is gone? You know I haven't really thought hard on it. Once in a while I think about it, simply because it is a part of life - you think what am I going to do after the show is over. I am not sure, though I would like to continue to grow and finesse my profession. Whether it is here in Hollywood or some place else, is not that important to me at this point in time. I don't have any major plans, simply because I don't know what other options I may have outside of acting. As far as acting goes I'll just keep doing what I'm doing and try to get better at it. Being an actor, at this point in my life there is not that much control possible, and I don't have any specific desire to pursue a particular course whereby I plan to be at a certain place by say February 1997. At the moment I am happy to allow nature to take her course. 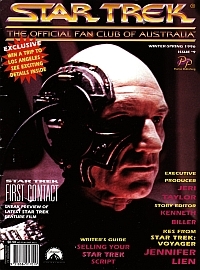 Did you have any concept of the dimension of the STAR TREK phenomenon prior to STAR TREK: VOYAGER? Absolutely not. It is amazing to me that it is 30 years already. That's longer than you have been born! For a concept - a show - to be going for 30 years, it is such a huge feat. I am happy to be learning about it, and to be involved in it. It is a little awe-inspiring, but it is a good feeling. You have had some stage in your acting background, and with STAR TREK having a Shakespearean element to its drama from the beginning, it must have been a help in the characterization? Yes it has been good. A strong stage background has always made it easier to work in the STAR TREK arena - certainly not in all areas, but it has helped. Despite being an action-based show, there is a lot of oratory in STAR TREK - the dramatic elements certainly do slant towards the Shakespeare theme, and a good solid background in stage is rally a bonus. What was you perception of the sudden resignation of Genevieve Bujold? I really don't know what actually happened. I was there the day when Genevieve was working and I believe that she just decided that it was for her and unfortunately I didn't really get a chance to work with her. That is really all I know - everything else is speculation, and I haven't had the chance to talk with her on the matter. At any rate, the cast is very happy with how Kate [Mulgrew] has fitted in - it was seamless, given that Genevieve was only on set for two days. In modern times, VOYAGER is the first show to hit the network route, with THE NEXT GENERATION and DEEP SPACE NINE going the syndication pathway. So it has been a little different for us, as our coverage area is not quite as widespread. UPN is an exciting new network that still has to find its feet. Experimentation is happening, but it should settle down with time. There has been no pressure from anybody as far as the ratings are concerned - everybody who works on STAR TREK always gives their best. The show has been moved to a new day and a new timeslot, so that could provide a bit of a change in the demographics. It is just a case of waiting and seeing. You have been very lucky with Kes' development. Some of the other characters, such as Tom Paris, have not really had any positive direction to their progress? Yes that is true. Kes' voice has been found very early as has the Doctor. The captain is very strong, yet sensitive. With Robby's [McNeil] character of Paris, the writers have addressed this almost as we speak. The opening episode [of filming] for season three has a huge action-packed, funny, and interesting arc to it completely centred around Paris, and Robby does a great job in delivering the writers' intent. Look out for that one. Have you been trying to keep busy with your acting during the hiatus? Not really. I haven't been pushing that at all. I did a couple of voice-overs during the summer and the rest of the time I just spent with my friends and family. It was good to just unwind and catch up on some books and movies. During the year we work very hard for a long period of time, and the hiatus is a great time to re-vitalize. How do you find the convention circuit? I have done a few. The conventions that I have done have been great and I enjoyed them. In truth, I haven't done tons of them, but I am sure there will be time to attend some more in the future.